However, despite the permanent injunction, the game, which features a pimp, a hoe, a 40-ounce bottle, a machine gun (oozie), a marijuana leaf, a basketball and a piece of crack as game pieces, is once again available for sale — most notably through Seattle-based, online retail giant Amazon at a premium price of $114.99. The game’s official website automatically re-directs visitors to the page where the product is sold on Amazon’s website. According to a domain registration search, the domain is registered under Ghetto Poly Inc. The domain registration was last updated in August 2012, and lists Chang as both the administrative and technical contact. In a 2003 interview with The Seattle Medium, Chang, who emigrated at age eight from Taiwan with his family, said he views the game as humorous and not degrading. 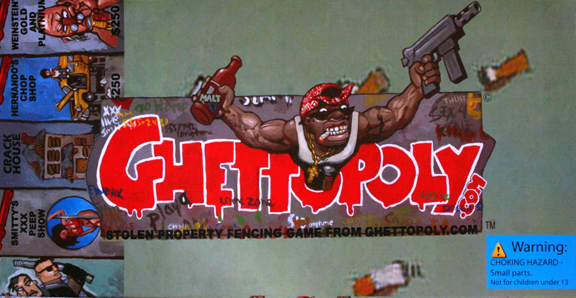 According to a press release promoting the game, Chang did his market research by watching MTV and studying the lyrics of rap and hip-hop music, and video games provided him insight into the culture of the ghetto allowing him to come up with the names of the properties of the game in just a few hours. Chang doesn’t feel that the game depicts any single group, rather that it pokes fun at everything associated with the ghetto. Carl Mack, former president of the Seattle/King County NAACP, did not find the game funny or amusing. Mack and a former Seattle/King County NAACP member, Eric Dawson, were the catalyst of the 2003 nationwide protest of the game when they went into the Downtown Seattle Urban Outfitters store and demanded that they game be taken off the shelf. The recent discovery that the game is once again available for sale has many in the African American community questioning the availability of the game through a retailer like Amazon. As of press time, six days after being contacted, the game is still available through Amazon’s website. “It appears to me that they [Amazon] will not do the right thing until they are forced to do the right thing, and that is something that we should always remember,” said Mack.